Guess what? This is probably my most exciting blog post EVER! 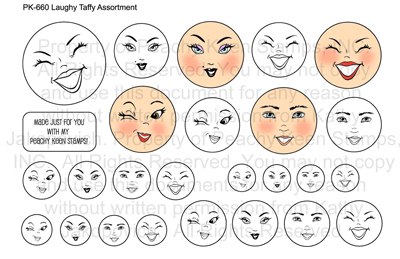 As most of you know, I am in love with Peachy Keen Stamps Laughy Taffy Assortment. They are sassy, sweet and just so cute! I like to sing “Laughy Taffy make me feel crafty!” Anyway. Peachy Keen Stamps is helping me host a Sassy Challenge! And guess what one lucky random winner will receive? YEP! The Laughy Taffy Assortment Set! Whoever wins is going to be sooooo happy! All you need to do is make a “sassy” card. It can be a sassy princess, animal, fruit, anything! ***You don’t have to use Peachy Keen Stamps, but it is encouraged! Link up your project below by Sunday, October 24 at midnight and I will choose a random Monday, October 25. Good luck Laughy Taffy sassy crafty friends!